We have over 65 years experience in creating customised design solutions for the home. Whether it's bespoke kitchens, designer kitchens, German kitchens, bedroom furniture or fitted wardrobes that you are looking for, you have found to the right place. This is only a fraction of what we have to offer. Woollards of Mildenhall is a family run business since 1947. We pride ourselves in attending to our customer's needs and helping to create individual design solutions, so that you achieve your perfect living space, whatever your budget. Experience our expertise in product selection, innovative design and customer service. We aim to provide absolute customer satisfaction and can work to strict timescales and budgets. 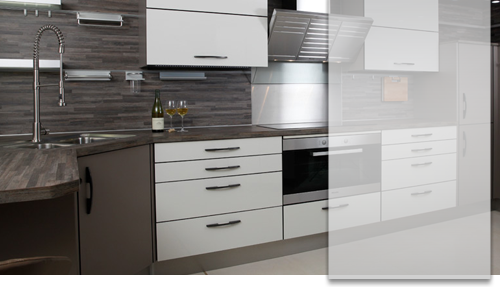 If you are looking for bespoke kitchens in Thetford, then let us inspire you with our large variety of displays at our kitchen showrooms. We also cover areas such as Ipswich, Cambridge, King's Lynn, Bury St Edmunds, Newmarket and surrounding areas. Our showrooms are situated on a three-acre site in Mildenhall with ample free parking and within walking distance of the city centre. Whether you would like a german kitchen, want to increase your storage space, modernise your bathroom and/or bedroom, or find the most practical design solution for your individual room, we can help you with the experience we have gained in all of these areas We have an extensive selection of bathrooms and luxury bathrooms in a number of different styles and finishes. Whether you are looking for something modern or a classic style, then why not visit our bathroom showrooms and bedroom displays for inspiration. Our experts can work with you to help you find the best practical and innovative solutions for your space. What makes us unique is that we can offer a customer experience second to none. We have no "salesmen", we will not pressure you, and you are free to choose when you would like to speak to one of our experienced design experts. After discussion, usually to include a visit to your home, our designers will produce an almost 3D design of your new living space so that you can visualise just how the finished result will look. Please do remember that technology is just a small part of a process that is dependent upon traditional expertise and meticulous attention to fine detail. This initial consultation will enable us to gain an understanding of your goals, needs, hopes & dreams so that we can help you achieve the result that you are looking for.